OUTGOING AIB CHIEF executive David Duffy (along with three of his fellow executives) appeared before the Oireachtas finance committee this afternoon, but there weren’t too many sparks flying. The biggest revelation to come to light is that the bank is likely to cut its variable mortgage rates sooner rather than later. The bank had already cut said rates by up to 0.25% last December, making it the only Irish bank to do so in recent times. The committee was expected to focus on AIB’s standard variable mortgage rates and whether or not the bank plans to reduce them, together with the bank’s attitude to the mortgage arrears crisis. Looking tanned and relaxed, the CEO looked very much like a man whose days in his current position are numbered. 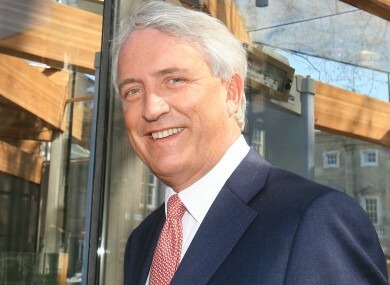 He is leaving the bank in due course to take up the chief executive role with Clydesdale Bank in the UK. In both his opening statement to the committee and throughout the questioning proper, Duffy was adamant that any rate cuts would only be processed assuming ‘positive market trends’ continue. Most Irish variable mortgages are on rates of in or around 4% at present, with the Eurozone average being below 3%. When pressed upon the matter by Limerick Fine Gael TD Kieran O’Donnell, Duffy was finally slightly more specific as to when the next rate cut might happen. “If we continue to see the same level of favorable market trends coming through, we’ll make a cut in the next month or two,” he said. Currently AIB has 135,000 variable rate mortgages on its books. Duffy was insistent that the bank can do nothing to endanger its profitability given it’s the Irish taxpayer as the bank’s largest shareholder that stands to lose the most. We have to be very careful. This bank has a margin of 1.6% on its profitability, that is a very slim margin with which to be operating with. Sinn Féin’s Peadar Tóibín inquired as to whether the government had made any directions towards the bank in any shape or form given the more favorable economic conditions currently prevailing. Duffy insisted it did not, and that even if it had the government has no sway over the operations of the bank. When Tóibín persisted and asked whether the bank’s attractiveness to an outside bidder is in any way reflective of the decisions made by the bank’s board Duffy was more dismissive. The fact is the bank was losing billions. We’ve returned it to primary profitability, that’s our focus. As to the mortgage arrears and repossessions situation, Duffy insisted that AIB foregoes the legal route ‘once borrowers engage with us’. In AIB’s submission to the committee it emerged that the bank had launched legal proceedings to repossess some 5,700 owner occupied homes by the end of 2014, with a further 3,900 under threat of such action. Labour Senator Aideen Hayden asked for more clarity on this ‘tsunami’ of repossessions. Responding, AIB’s Head of Financial Solutions Brendan O’Connor said that each situation came down to ‘financial realities’. “Where someone simply can’t afford to repay, they will get a writedown, it’s about what the individual can afford,” he said. Email “'We'll cut them again in a month or two' - AIB chief on mortgage rates”. Feedback on “'We'll cut them again in a month or two' - AIB chief on mortgage rates”.